Saturday was a special day at Ohio Stadium for William White, for more reasons than one. Regardless of what happened on the field during the Buckeyes’ game against Nebraska, Saturday was going to be a meaningful day for White because of a video that played inside the Horseshoe during the game. Featuring White, fellow former Ohio State players Chris Spielman and Archie Griffin, current Ohio State coach Urban Meyer, former coach Jim Tressel and his doctor at the Wexner Medical Center, Stephen Kolb, the video encouraged fans to donate to the William White Family Fund for ALS, which funds research for the disease White was diagnosed with in 2016. Saturday became even more special for William White, however, when his son Brendon White was called upon to take Jordan Fuller’s place in the lineup after Fuller was ejected during the second quarter of the game. In his first significant playing time for Ohio State’s defense, Brendon White excelled, recording 13 total tackles with two tackles for loss and putting himself in position to potentially make his first start at safety when the Buckeyes play Michigan State this weekend. To have that happen on the same day his video was shown at Ohio Stadium – which William White said was originally scheduled to be shown at the Buckeyes’ previous home game against Minnesota – was a concurrence that he could only attribute to an act of God. Brendon White, a true sophomore, acknowledged while meeting with the media this week that before his opportunity came Saturday, he had gotten down on himself last season and earlier this season when he wasn’t getting on the field. Through all of that, William White encouraged his son to keep his head up and stay positive. That hard work paid off for Brendon White on Saturday, and he couldn't help but get emotional about it. “After the game, I started tearing up, because I just couldn’t believe, growing up in Ohio, went to Olentangy Liberty 15 minutes from here and always going to the games as a high school kid, and then being able to play at your dream school, that’s pretty cool,” Brendon White said. Brendon White (25) made a big impact on Ohio State's defense on Saturday, recording 13 total tackles in a breakout performance. William White has taken his own positive mindset to his battle with ALS. While there is no known cure for ALS (amyotrophic lateral sclerosis), a progressive neurodegenerative disease that causes gradual loss of muscle function, White says he is focusing on living every day to the fullest instead of worrying about what he cannot control. “One of the things I always told my kids is things you can’t control, don’t worry about it. Things you can control, you go out there, you fight, you do all the hard work you can, to make that change, to make it right,” White said. “There’s nothing I can do to help cure this by tomorrow. There’s no need to be worried about it or get mad or anything like that. You live your life. No one’s guaranteed next year. So you live each day that you have and it will happen when it happens, but you do the work to help fight the cause. 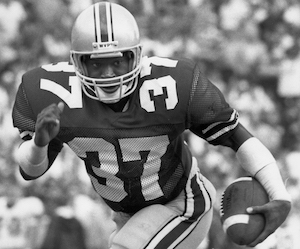 While there have been studies that have linked playing football to a higher risk of contracting ALS, White – who was a team captain and All-Big Ten cornerback for the Buckeyes before going on to play for 11 seasons in the NFL – said he has no regrets about playing the sport he loves, nor did he ever try to deter his son from playing the sport. There is no known cause for non-inherited cases of ALS, and White said he is currently the only former football player in a research group of 85 people who have ALS at Ohio State. “It may have something to do with it, but hey, it don’t matter,” White said. “If I knew I would have got this, I would have still played the game, because I loved it, and smacking people in the mouth was fun to me. Instead of feeling down about his own situation, White is trying to use his situation to help everyone who has been diagnosed with ALS or could have to battle the disease in the future. White, who is now the director of community and corporate engagement for the Ohio State College of Engineering and Alumni Association, said everyone he asked to be a part of his outreach effort said yes, which he attributes to the familial bonds that Ohio State builds between members of its community. To donate to White’s campaign against ALS, you can text ‘KickALS’ to 41444 or visit give.osu.edu/kickals. Donations are tax-deductible and can be applied to Ohio State’s donor recognition programs.